Sam: What kind of bird are you? Just to get it out of the way, I am a big fan of writer/director Wes Anderson’s work (Rushmore, The Royal Tenembaums, Fantastic Mr. Fox, etc.) and was already inclined to enjoy his latest film. 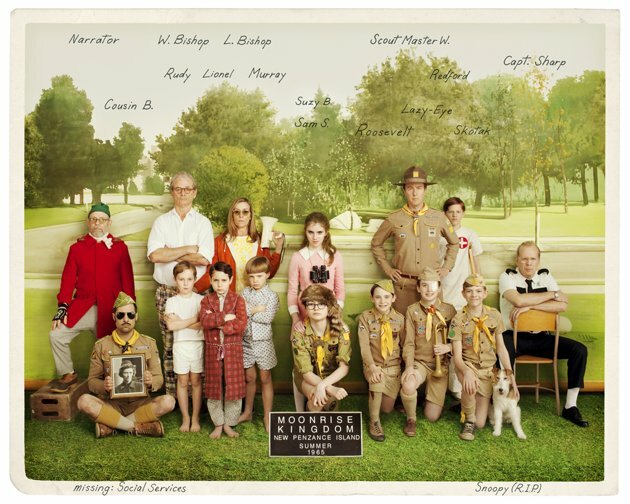 The fact that I really enjoyed Moonrise Kingdom does not come from a bias however; it comes from recognizing a well-made feature that is full great things, which includes warmth, whimsy, and affecting moments. Anderson’s idiosyncratic filmmaking sensibilities have served him well here, providing a film that should play well to more than just the audience that already enjoys his films. It is the sense of innocence that is wrapped up inside a film that is frequently humorous and always alive with visual details that makes it a film worth seeking out. Set in 1965, off the coast of New England, on an island known as New Penzance, the story is focused primarily on young love. As the film opens (and after a narrator played by Bob Balaban fills us in on some details about the island), we learn that a young girl, Suzy (Kara Hayward), and a young boy, Sam (Jared Gilman), have run away from home, into the wilderness together. Sam was a part of the Khaki Scout Troop and feels he has the skills needed for them to survive on their own. Having known each other only briefly, before embarking on this adventure, Sam and Suzy explore the relationship they have together, in a way that is fitting for such inimitable kids of their type. As this is going on, the various authorities involved are all up in arms about finding Suzy and Sam. This includes Suzy’s parents, Mr. and Mrs. Bishop, both lawyers (played by Bill Murray and Frances McDormand); the local Sherriff, Captain Sharp (Bruce Willis); and the Khaki Scout troop leader, Scout Master Ward (Edward Norton). It is a very serious situation, as many attempts are made to bring these kids home safely, but even with that as the goal, understanding that these kids really do want to be together is something that may play heavily into the relationships that some of other residents of the island have with each other. 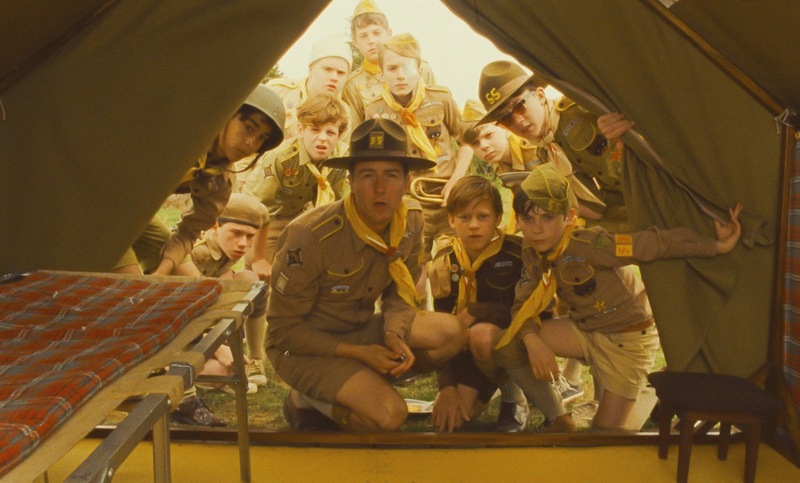 I find it interesting that Moonrise Kingdom seems to have found the way to really bring out the best in what Wes Anderson has been doing in all of his previous features. I would not call this my favorite of his films, but there seems to be a definite confidence in his craft here. He has not compromised any of the aspects of his style for the sake of wider appeal, but instead grown into finding what works in it and going from there. Similar to something like the Coen Brother’s True Grit remake, which I found to be a film of theirs with the most mainstream appeal since Fargo, Anderson has seemingly made his most easily watchable film since Rushmore (I basically put Fantastic Mr. Fox in some other fantastically whimsical category all together). Moonrise Kingdom has a story with a lot of absurdist qualities and the same eccentric details that go into all of Anderson’s films, but this time he has done so in a seemingly more engaging way. The cast is pretty fantastic. I will get to the adult actors next, but first the spotlight goes to young Jared Gilman and Kara Hayward. Neither of these kids fall into the category of being generically “cute” or “precocious”. Instead, these kids have particular qualities about them that make them feel wholly appropriate for the film. They radiate charm on screen, especially as they interact with each other, which even goes to the length of having them mildly explore their sexuality (kissing) in an unabashed fashion, but not in an exploitative manner. Both Gilman and Hayward are talented young actors who wonderfully handle the various nuances and attention to detail that Anderson brings to his films. The adult actors are great as well, which is fitting, given the pedigree. 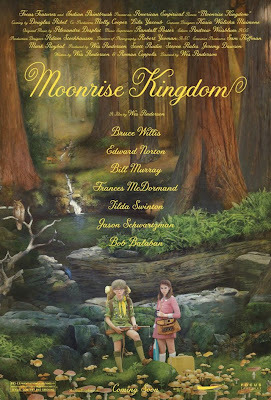 Bill Murray is a veteran at this point, as this is his sixth Wes Anderson film. He and McDormand spend the majority of time together and he continues to put his driest of humor up to the test, while McDormand has a role that could be grating in the hands of another, but she humanizes Mrs. Bishop easily. Edward Norton’s character is desperately seeking to prove himself, which is fun, given the way we see him handle his Scouts and later become overwhelmed by dealing with the events of this film. Bruce Willis nails another role that involves him being very understated in his delivery. He is a character that functions thematically as a possible older version of Sam and his actions throughout reflect that of one who has lost something, but still hopes to achieve success where he can. 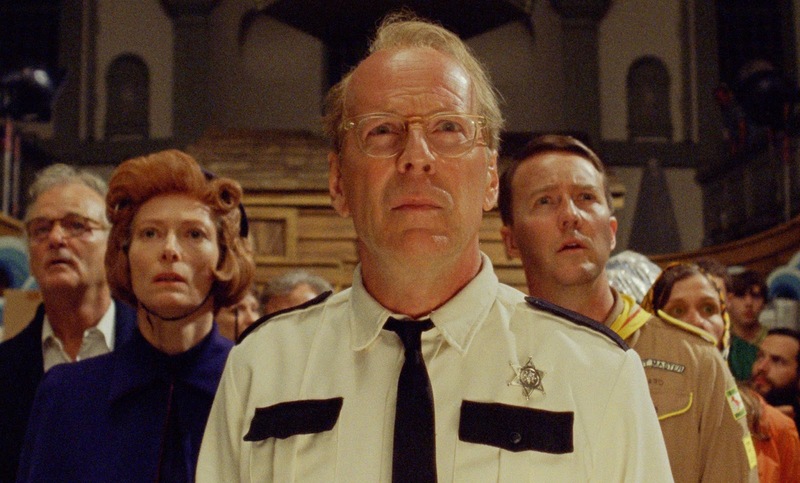 I should also note that Tilda Swinton shows up as a no-nonsense Social Services worker and Jason Schwartzman is a con man of sorts, practically an older version of his Max Fisher character from Rushmore. A true delight in this movie is the visual aesthetic. True to form, Wes Anderson utilizes those involved in the art direction and production design of the film to really put his stamp all over it and it is quite gorgeous throughout. Every frame of this film has something very deliberate going on in both the foreground and the background. The New England wilderness location is a neat place for these characters to exist in and it speaks to Anderson’s style that a whole universe is successfully created in this film. Beyond having a literal layout of where everything is located, it is the work done in showing off the sets, providing the details in the places we get to see, the costumes and accessories that these characters have, and the various call backs to everything that is pre-established. Mr. Bishop: What am I lookin' at? Mrs. Bishop: He does water colors. Mostly landscapes, but a few nudes. I keep mentioning Anderson specifically, because he falls in line with directors with a very clear style, which can be identified simply by looking at a scene and how it is shot. Anderson’s use of zooms, steadicams, and long takes, all while utilizing a majority of his cast at one time continues to fit well into his style. In addition, despite dropping the use of various pop songs throughout, the soundtrack is once again fantastic. With a score by Alexandre Desplat (and some involvement from Mark Mothersbaugh) and featuring many classical tunes, the soundtrack very easily fits with the themes and design of the film. 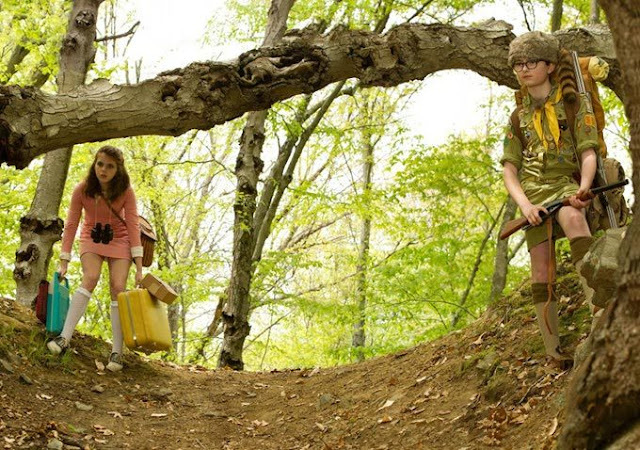 Oh, and Moonrise Kingdom is very funny too. It is a film that contains a lot of humor throughout, based on how these performances are crafted and how the bits of information we receive play a role later on in the film. Many great moments sometimes come as a surprise and other times are perfectly setup and paid off. As with Anderson’s other films (in my eyes), Moonrise Kingdom is definitely one that will reward multiple viewings, given the visual details and the deadpan nature of a lot of the humor. What helps is how much of the humor manages to tie into the way characters and plot is developed. As this is a fairly lean film (coming in at 90 minutes), enough time is spent setting up who these people are, so when the film really becomes plot focused, it is aided by developments that are nicely woven into the story and pay off in the form of comedy in an effective manner. Anderson and co-writer Roman Coppola have done quite a bit in making this film, which contains many serious and dark elements, quite an enjoyable experience. If there are any missteps, I believe it comes in the finale, which is a bit busy. With so many characters it seems like a few too many things occurred and some very specific moments. I will not spoil what happens late in the film, but certain things somewhat threw me a bit off balance from what I was mostly satisfied with throughout. With that said, the finale of the film did a lot thematically in reassuring why innocence is something that should be cherished. Given the fairly cynical nature of many of the characters in almost all of Anderson’s other films, it was neat to see a slightly different approach this time around, even if it came at the cost of not having a more cohesive third act. 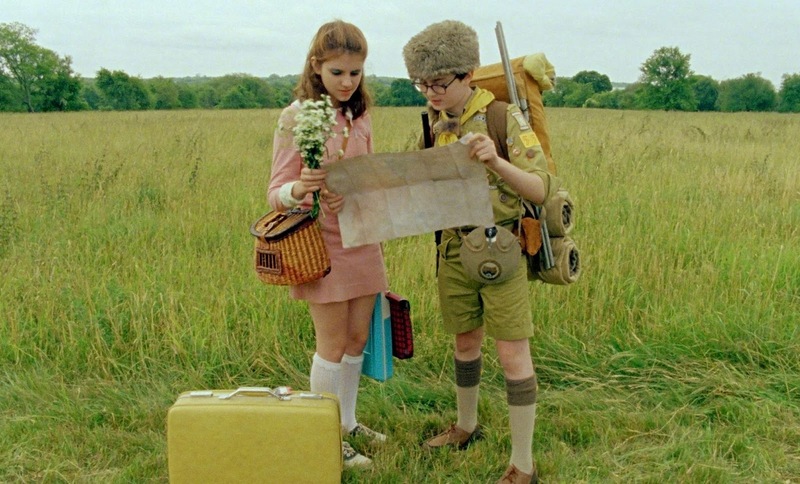 Moonrise Kingdom was the kind of film that fitted a smile on my face for the majority of its runtime due to how charming and delightful it was to watch. The film is frequently quite funny, beautiful to look at, thanks to the fantastic art direction and the cinematography by Robert Yeoman, and, especially, one that I look forward to watching again. Regardless of the enjoyment I get from watching Wes Anderson’s films in general, I still think that Moonrise Kingdom is one that will be accepted by many, were they to give it a chance. It definitely oozes with style, given the filmmaking techniques and somewhat dry humor, but it is very enjoyable and has themes that could easily resonate with many. Plus, you get to see Bill Murray wear lots of cardigans. Mrs. Bishop: Does it concern that your daughter has run away from home? Mr. Bishop: That's a loaded question. nice review but yes, you do have a bias and it's undeniable. I mean, it's not something to be ashamed about but no matter how hard you try to control it or hide it it will stay there, so I'll take this review with a grain of salt as I'm personally not a big fan of Anderson's like you, I find him pretty hit and miss. Well how far does that extend? If I didn't bring up the idea of bias, would that have even been a point to mention? I'm a big fan of Tim Burton films, but I am able to recognize the weaker films in his body of work (Dark Shadows just recently). If it was a true bias, I'd be giving every Wes Anderson film 5 stars just for existing. I brought up the Coen Brothers very specifically as well, given that I love their movies but can see them not being ones that everyone enjoys. One could say I have a bias towards them as well, but again, I recognize the flawed efforts that have come from them. Time will tell if this has the mainstream appeal to become We Anderson’s biggest hit. The Royal Tenenbaums holds that distinction now, but I am inclined to agree with your assessment. It’s more engaging than anything else he’s ever done, but that fantastic cast doesn’t hurt. This summer has given us some letdowns. Glad this wasn’t one of them. A complex set of cinematic pleasures, ranging from its vibrant, eccentric visual presentation to its deadpan humour and superb performances. Oh, and the music!